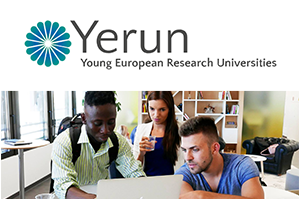 The network of young European research universities YERUN (Young European Research Universities Network) was founded on 9th January 2015 in Brussels. This network is special as it is made up of young European universities (i.e. active since less than fifty years) with accredited presence in the various rankings of international prestige (Times Higher Education, QS World University, Shanghai Ranking). The agreement signed by the rectors of YERUN network reflects their desire to synergistically cooperate towards increasing the influence of the youngest universities on research policies promoted by the European Union. The network aims at promoting joint teaching and research programmes at degree, masters and doctorate levels, as well as encouraging research in areas with a high social impact and exchange programmes for students, academics and admin staff.